This is not an optical illusion. I am holding up this shoe and it is wider than my body. It is a men's size 16, 4E width New Balance Basketball shoe. It is black and white, free of air pockets, and there are no gel elements in the sole. This is all to adhere to government regulations. I buy and sell shoes for a living. Did I mention that all of my customers are inmates in federal prisons? Quite a conversation piece, isn't it? Aside from peddling shoes, I write. I maneuver around the web and I have a bevy of virtual friends. I enjoy what I do. Sometimes I feel like I lead a double life. In a way, I do. My day job keeps me stable, pays my rent, provides me with benefits and grants me the funds to live a luxurious life. When the day dwindles down, of course I report back and share my experiences through social media. I love the interwebs but my sales training has taught me how important face-to-face communication is. You can paint any picture you want of yourself on the internet but a real life meeting is going to tell all. In upcoming posts, I plan to share the things I've learned and observations I find thought provoking. My blog is varied and will really be about anything on my mind for the moment. I hope you are enjoying it. Thanks for tuning in thus far. There is much more to come from Spam Is Better Fried! This year marked for the 10th annual Architectural Digest Home Design Show. The exhibition lasted for four days from March 17-20 at Pier 94. Admission granted for the design show, DIFFA'S DINING BY DESIGN, and Artist Project New York at Pier 92. The show featured a wide variety of products and services for the home from appliances and outdoor furniture to interior design consultations and general contractors ready to build you a tiled pool. Looking for a home security safe? Bird bath? Vintage posters? The Architectural Digest Home Show had it all. aviva stanoff, a local designer based out of DUMBO in Brooklyn, fashions pillows that are soft and luxurious. The pillows are hand made, silk, and feather down. The one exception on texture is the Let it Rock line. Encrusted with jewels, these pillows catch light and sparkle. The Art Glass Collection presented by Sun Valley Bronze reminded me of Venetian glass. Each piece is a work of art. 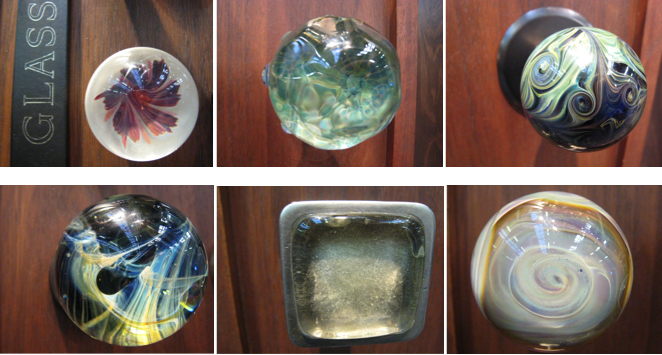 Sun Valley Bronze partnered with Jesse DeMoss to create a collection of hand blown door knobs. The designs are one of a kind and captivating. I couldn't help but stop to admire the craftsmanship. Prouna, maker of fine bone China, incorporates Swarovski crystals into their dinnerware. 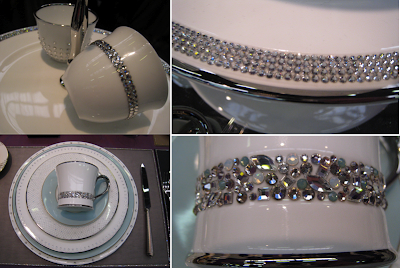 Simple and elegant, these dishes emit just enough accent and flash to be modern while still being traditional. Lighting came in all shapes and sizes from 8 foot tall floor lamps and spherical chandeliers to sturdy table lamps and sconces emitting mood lighting. Some of the pieces had the industrial look while others evoked 18th century romance. They were made out of all types of material. From copper, aluminum, porcelain and crystal beading to glass and recycled bottles. I was going to highlight a few desks and coffee tables but did not want to detract from the Prototype Desk made exclusively for dbOHome. It was designed and built by Daniel Oates. The legs are hand carved and wood is live edge Claro Walnut. I love the natural feel of it and the lightness of it. The three levels offer variance and the desk conceals two drawers well. If I heard correctly, the Prototype Desk is valued at $22,000. The Architectural Digest Home Design Show seemed endless at times. There was even a live auction taking place. It was less packed than The Armory Show which took place at the same location two weeks before. I was able to see and enjoy the show in one day without returning. All too convenient, there were quite a few seating options available for me to rest when I needed a break. 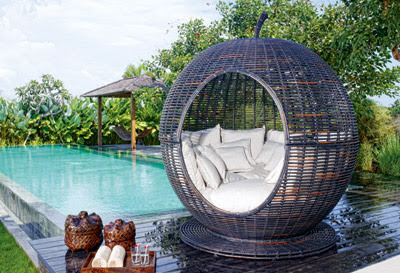 My favorite was the movable Iglu daybed made by sky line DESIGN. It looked like a giant wicker apple. Without a hint of green on it, the brown palace was made for the outdoors and the inside was pretty cozy. I'd sleep under the stars if it sat in my backyard. Ah, the Architectural Digest Home Design Show is good for dreaming. 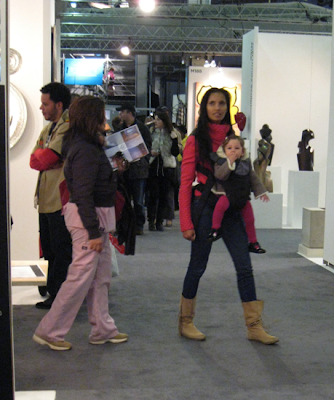 Spotted: Padma Lakshmi with her baby and nanny at the 10th annual Architectural Digest Home Design Show. She is strikingly beautiful in person and her baby is really cute. This celebrity sighting makes up for missing Katie Couric who practically bumped heads (literally) with my friend minutes before and me not recognizing Mark Ruffalo who walked right past me and stared at my face in the East Village. 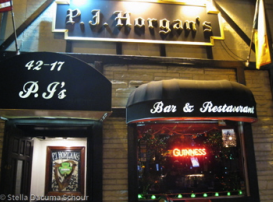 Last night my friends and I had an early St. Patrick’s Day dinner at PJ Horgan’s. Celebrating holidays not on the actual day of is right in sync with the way we do things. Back in January, I had a Christmas themed birthday party. We celebrated Christmas post Christmas and had a Yankee Swap. It was a ton of fun and there were presents for everyone! Our St. Paddy’s Day meal started off with Irish Soda bread. Soda bread is a “quick bread”. No yeast is involved and baking soda is used as an agent instead. PJ Horgan’s bread had raisins in it. 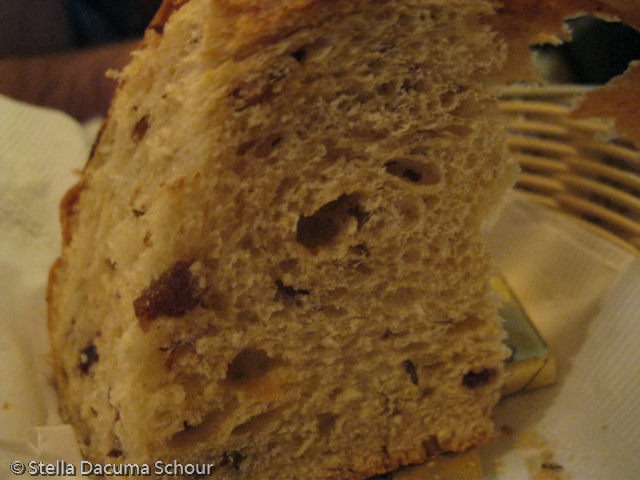 The bread tasted a little sweet which was good because without the raisins, it would have been a little lackluster. Pleased with the taste and texture (soda bread is known to be really dry), I didn’t think the bread needed any butter. We then ordered a few traditional Irish pub staples. When I think of Irish food, I immediately think of corned beef with cabbage and potatoes. Irish food is known for the potato being a staple. 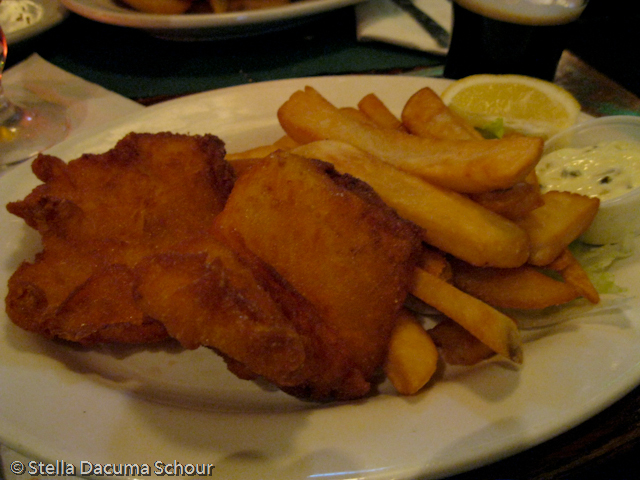 I wouldn’t mind eating like the Irish every day. I love potatoes in any shape or form. The fish (two hunks of white fish battered and deep fried) and chips were served with tartare sauce. They weren’t too oily. The batter provided a nice crispy outer coating; a protective layer to the flaky fish. The Shepherd’s Pie was minced beef with brown gravy and peas. The potatoes on top were whipped and looked as if they had been torched. The dish was comforting and reminded me of some home cooked food my old roommate’s mother made for us once. 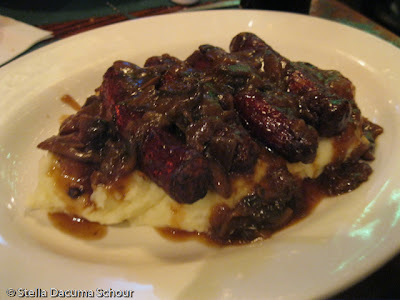 The Bangers and Mash were sausages in mushroom gravy which sat on top of mashed potatoes. Although not meant for breakfast, I wouldn’t mind eating this in the morning. The sausages reminded me of breakfast sausage links. Last but not least, I end with the Chicken Pot Pie. 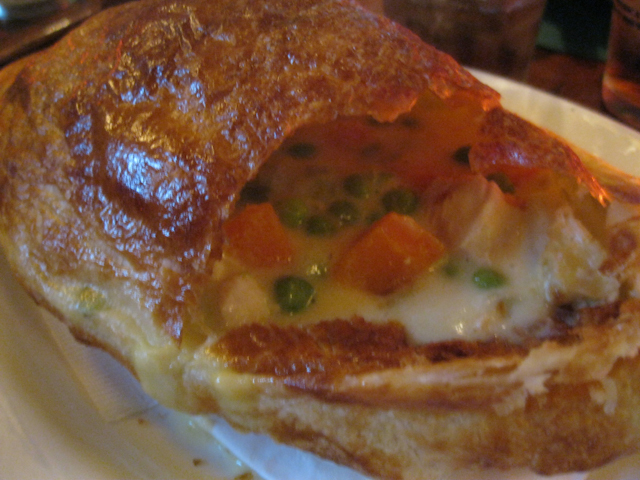 I have been searching for a chicken pot pie far and wide in New York. PJ Horgan’s was my first try and I was not disappointed. I felt like the Chicken Pot Pie was our lucky find. It arrived with a golden crust, piping hot and in the shape of a shell. As I cut open the pot pie, steam was released and gave way to succulent cubes of chicken with peas, carrots, and potatoes. This chicken stew was the perfect meal for the evening. The crust was buttery and thin. It brought back memories of the chicken pot pie at The Grill on The Alley in San Jose, California, which I highly recommend. There was plenty of pot pie to go around and I gladly shared. Where in the World is Carol and What is She Doing? I have a friend named Carol who travels around the world for fun. She doesn't go to the typical tourist areas, although I am sure she has been to those before. These days I hear stories of Carol balancing owls on her arm, riding camels through the desert, and eating yak in the Himalayas. She's traveling right now and I thought it would be interesting to guess what she is actually up to. I'll get the full report soon enough and report back. Let's see how close and how far off I actually am. A. LHR - Carol emailed me saying she was in the London airport Heathrow. She must be stopping over for a connecting flight. I highly doubt she went there just to hang out. The last time I was at Heathrow I was amazed at how thick the air was from all the smokers even though there were designated smoking areas. A smoking ban on all enclosed areas in the United Kingdom was enforced in 2007. I will have to ask Carol what the airport is like now. 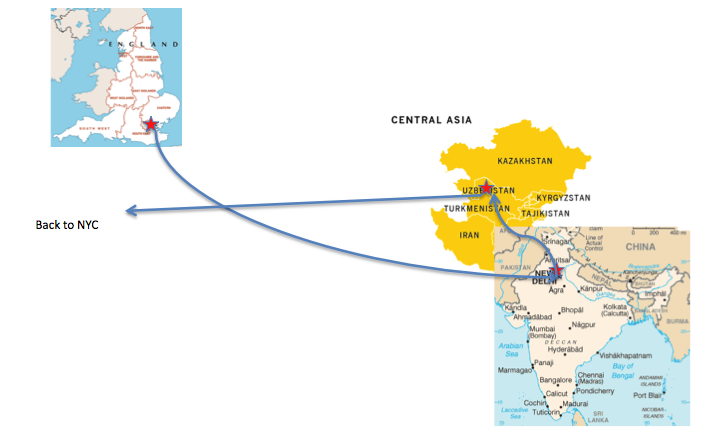 B. Carol is en route to New Delhi where she will be "for a few days". Just how many? She didn't say but I'm guessing six. Otherwise she would have said "a week" and I think three days is too short "for a few days." What do you think of my detective skills? I have no idea what there is to do in Delhi, despite three of my old roommates being Indian. They've told me things about India but I guess I wasn't paying close enough attention. I wonder what type of interesting curries Carol will eat and if she fell victim to the "Delhi Belly". C. Tashkent - Where? I had to look this one up. Tashkent is the capital of Uzbekistan! Uzbekistan makes me think of Borat even though he was from Kazakhstan. I wonder if she will encounter any Russians. If you would like to play along and guess what Carol is up to, feel free to post in the comments. Hey, we could even turn it into an elaborate adventure, although I am sure there will be some truth to that tale. Carol was once mistaken for a spy! My experience at Pod was one foodgasm after another. The food at Pod is amazing and reasonably priced, if not underpriced. 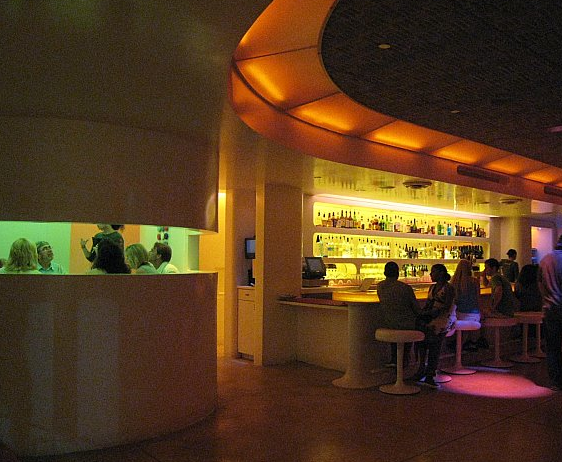 It is an economical bliss with out of this world ambiance. I often find myself daydreaming about Pod when I just want to get away. When I moved to New York, I moved 3,000 miles away from home. A drive down to Philadelphia is a mere 100 miles from New York but at Pod, it feels light years and a universe away. Pod is futuristic. It offers traditional Asian fare with a twist. The place is like an outer space playground with ever changing colored lights, a bubbly ceiling, and white on white interior. The sushi boat is a world of its own and if you fancy anime, the screens are like windows of cartoons. I saw waitresses carry out birthday desserts with sparklers. They were just one candle short of Fourth of July. The service is excellent, welcoming, accommodating, quick, and knowledgeable. Everything thumbs up. The ultra hot weather called for mocktails, one Cucumber and Apple Spritzer and one White Peach and Mint Soda. Both were refreshing and full of fresh fruit. 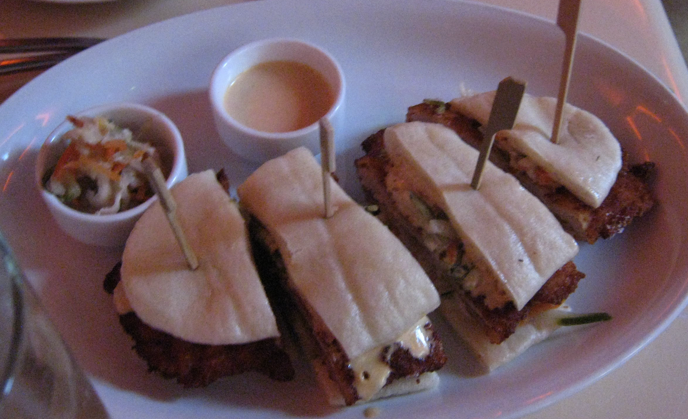 For dinner, we ordered the special Lobster Ramen appetizer, Tonkatsu Sandwich, and the Rockin Spicy Tuna. The Lobster Ramen was not soupy but had a creamy rich broth-like dressing. 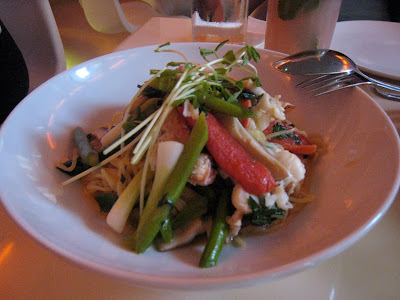 The lobster chunks were huge and tender, the vegetable medley offered crunch and the noodles were fresh and not over cooked. The Tonkatsu Sandwich could easily rival David Chang's pork steamed buns. The Rockin Spicy Tuna was food with flair. Sprinkled with black sesame seeds and prepared like little works of art, the spicy tuna was like a sushi hors d'oevre. 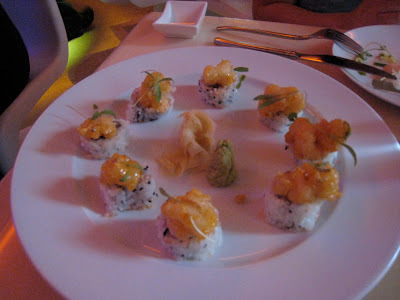 It was topped with popcornlike tempura rock shrimp and microgreens. The meal was enough to give one an outer body experience. If Pod's tactic to get people to order dessert was to send in a tattooed dessert man instead of our friendly waitress, then it surely worked. I just can't say no to a man with tattoos. We were set on Chocolate Chocolate Chocolate (chocolate toffee bread pudding, chocolate shot with salted rim, and chocolate tart) but when TDM told us about the special Chocolate Flan we had to make our dessert choice Chocolate times four. Death by chocolate all the way at Pod. No worries, you will live to tell the tale of sweet decadence. The Chocolate Flan actually turned out to be light and was complimented by an Earl Grey Tea coulis and black cherries. I could easily devote a whole review to these desserts. Instead, just trust the smile on my face that they were all exquisite. It's a wonder why Pod isn't advertised on travel sites. It's a trip without breaking the bank. One of the things I love about New York City is that there is always something to do. Whether I want to spend the day alone, have planned something with my friends, or am invited to an event, there are always options. This week was a big week for art in NYC. There were a number of fairs and festivals taking place. The one that immediately caught my eye was The Fountain Art Fair since it supported independent galleries, street art, performances, and music. Although that was my immediate plan for the weekend, I decided to pass it up because my friends and I received complimentary passes to The Armory Show at Pier 92 and Pier 94. Clinton Cove, located next to Pier 94 in Hudson River Park, turned out to be the perfect meeting spot for my friends. It was a beautiful day in NY and we took advantage of the warm (59 degrees) weather. There were benches all along the park but we only got to rest a little bit before spying a giant wine bottle. Giant is an understatement. This wine bottle was larger than anything you could find at Costco. It was 30 feet long and 8 feet wide. Malcolm Cochran, a professor at Ohio State University, based Private Passage on the Queen Mary's stateroom. There are portholes along the side that allow you to see into the wine bottle. The portholes on the top act like skylights allowing light in. You'd be surprised. It looks like a house in there complete with a kitchen, bathroom, and sitting room! The Armory Show featured modern and contemporary art. Here is a sample of some of the artwork at the show. Admission to The Armory Show also included access to it's sister fair Volta NY. Volta NY, on a much smaller scale, was dedicated to solo exhibitions by emerging artists. Spraypainted on cardboard, EVOL's take on urban society really caught my eye. The Armory Show is held over four days. It would really take that long to see everything in leisure. I had sensory overload after two hours. If you plan on attending the event next year, don't forget about the wine bottle on Pier 86. Although not part of the Armory Show, it is one thing you won't want to miss.